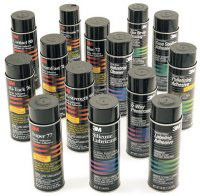 Our family of 3M products includes the extensive Adhesive Products line. In this group you'll find adhesive solutions through the use of Aerosols, Jet melts and Structural Adhesives. Browse below for possible ideas. Convenience and speed. Super 77 securely bonds many lightweight materials and can be used in displays, furniture, sheet metal and fabric applications. Hi strength contact aerosol No. 90 is ideal for a variety of substrates including polyethylene, polypropylene, wood, metal & more. Temperature resistance to 160�F. 3M has water based one component contact adhesives with instant tack for the assembly of insulations, fabrics, wood and many other materials. 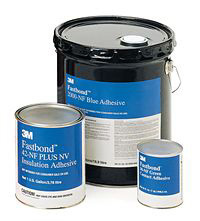 3M Jet Melt adhesives provide a versatile line of high performance for fast, strong bonds on surfaces such as wood, plastic, foam, fabric, rubber, cardboard. We have applicators as well. 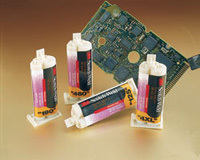 3M electronic grade epoxies are ideal for assembly of sophisticated electronics where outgassing and corrosion of material bonds are a concern. These two-part systems are an excellent alternaative to mechanical fasteners and lower grade adhesives. These products produce far lower contamination levels of ionic and outgassing impurities then typical epoxy adhesives. Great for critical components. Industrial quality formulations for bonding a wide variety of non-load bearing materials to themselves, or metal, wood, plastic and more. Full range of ultra fast bonding "Pronto" adhesives. Resistance to fuels, oils and other chemicals. A single drop per square inch can bond many plastics, rubbers and metals with tensile strength to 5,000 PSI. Temperature range from -40°F to 200°F.